Today is one of those reflective days where I am mostly contemplating random thoughts while trying to catch up on household things that have been neglected while finishing some other projects. My friend sent me the link to Monica Moshenko’s radio program Disability News Radio. During a break from cleaning I listened to some of Monica’s interviews. I loved how she started the program with a discussion of the word disability. She said that we should focus on abilities not disabilities. Going back to my work I remembered my November 2005 post The R Word – Retardation. In that post, I shared how we told Billy Ray that retarded just means slowed and we are all retarded in some ways. My friend countered that post with showing me a picture of her client pushing her stalled car with his electric wheelchair, which I put in Who's Tarded. Since writing those posts I heard (or read) someone say “differently able”. Sorry, I don’t remember where that came from but I love it and totally agree with it. We all have abilities and disabilities. In a building where Billy Ray and I went to see his doctor, we frequently rode the elevator with a man in an electric wheelchair. Attached to the back of his wheelchair was what looked like a cooler and contained bags with coffee or sweet roles labeled with the customer’s name. He didn’t talk but appeared to understand well. It appeared that his only movement was his right hand which could run his electric wheelchair and use a baton to push the open door or elevator buttons. Apparently a coffee shop near several buildings had a service where clients could call in and this man would deliver the coffee. Customers would reach into the cooler to get their order. You would see some of his customers meet him at the elevator or holding open the doors to their offices so he could come in. He would squeal with a joyful greeting with each one and the customers seemed to thoroughly enjoy seeing him. Many times in the winter his plastic raincoat would be dripping from our Oregon rain. It never seemed to dampen his joyful mood. Clearly he loved his job. Unless someone saw this man actually doing this job they might assume he had no abilities and they would be very wrong. Today I am reminded that we all have more ability in some things than others. New technology is not our thing around here. If software or equipment works, I have no desire to upgrade and learn all over again. Case in point, probably a year ago Larry’s cell phone and the one we keep for Billy Ray’s support person to use when they take him out had to be replaced. My cell phone was more than four years old but it was comfortable and still working. In April it stopped holding a charge and had to be replaced. The new one came with an ability to shoot videos and photos. No desire to learn to use that when I could stay with digital camera I know how to use. That is until yesterday!! Yesterday, Billy Ray bented his new eye glasses and so we made an unexpected trip to Bend to get them fixed. We were in Bend at lunch time and he needed to eat so he could take his pills. We took him to Red Robin. There is a Red Robin in Clackamas near the Kaiser Permanente where he often went for lab tests or medical appointments. He loves their hamburgers, onion rings and cheese sticks. However, he developed both pancreatitis and diabetes soon after our move to LaPine and we were supposed to keep him low fat. We never told him that there is a Red Robin in Bend for that reason. His pancreatitis is stable at the moment and blood sugar good for the past several weeks. 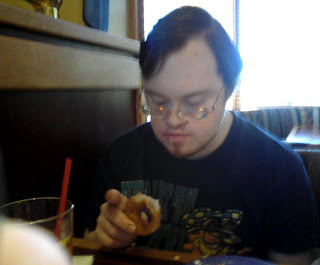 His wonderful primary care provider has given me permission to give him a treat once in a while so we did Red Robin yesterday. 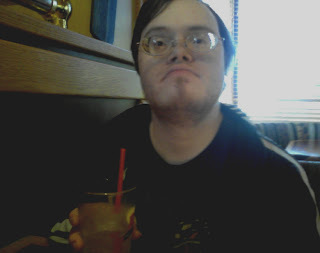 He looks so cute in his new glasses (Dr. Carl Ryan managed to make them smaller, though a stronger prescription, than before) and I also wanted to share his excitement at being at Red Robin after not being to one in nearly three years. No problem we have a camera on this gadget or so I thought. It took quite a while to figure out the camera even though my husband had just figured it out on his phone but, of course, they are all different. Then today I could not figure out how to email them to myself. My husband finally managed to email them from my phone to my computer so I am posting here. As if to support my feeling of inadequacy technically, Blogger will not let me enter a title to this post no matter what I do and I forgot to upload the pictures before publishing this so had to do it again. At least I discovered that Blogger was having the problem with the title line not me and I was able to add it after a lot of frustration. If we could all look at a person’s abilities instead of disabilities we might realize how much we ALL have to bring to the world we live in. Differently abled! Finally a term that doesn't imply that there's something completely not right about someone's abilities. Thank you, I love it! I finally got some time to read a bit and catch up with you and Billy Ray. I cannot even sign into Blogger due to a cookies issue that is just with this site and my computer. I recently signed up to hub pages and was trying to hook up google ad sense with blogspot, but had no such luck. Other people tell me to try squidoo and I cannot really comprehend that site and hub pages. Another site people write articles for pay at is http://www.constant-content.com but hard to search for any topics. I like associated content when time permits. A boy at the autism camp broke his eye glasses on friday while they were having water play outside and he was very scared of what his parents would say. I have not listened to the disability radio show or even autism one. Cannot seem to figure out radio online. For sixth grade I am homeschooling my son and learning all about virtual academies and way behind in my own writings. We all do have a lot to offer.